Transform your magazine, newspaper or brochure into an easy-to-use app for smartphones and tablets - quickly and cost-efficiently. Optimise your print content for the digital future - ContentConverter uses innovative software to guarantee a great reading experience on almost all available devices. Gain new readers with our app and open up new sources of revenue. The IFRA World Publishing Expo and the DCX Digital Content Expo took place in Berlin between 10 to 12 October 2017. The ContentConverter team participated as an exhibitor. We presented the current app with many new extensions and live demonstrations of the system in cooperation with bitspire Kiosk. Benefit from our publishing solutions for publishing houses, corporate publishing and agencies. 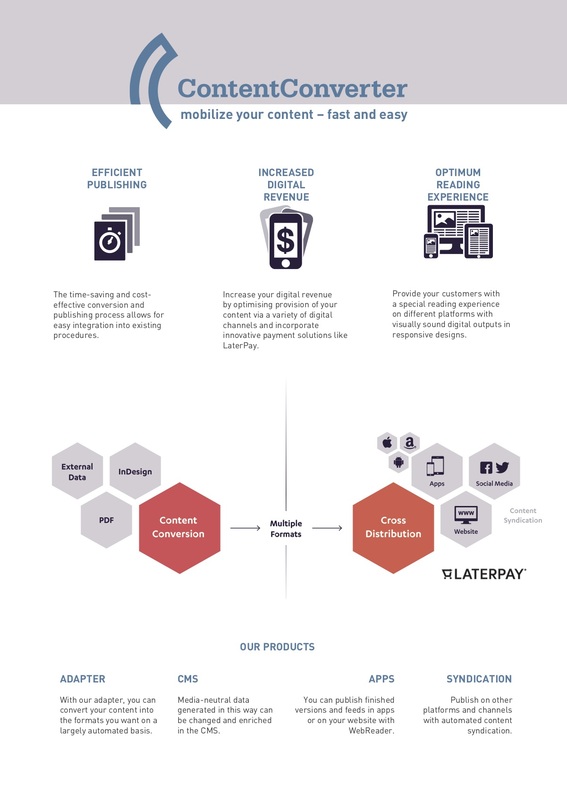 Increase your digital revenue by optimising provision of your content via a variety of digital channels. The time-saving and cost-effective conversion and publishing process allows for easy integration into existing procedures. Provide your customers with a special reading experience on different platforms with visually sound digital outputs in responsive designs. Conversion & distribution: You can convert content from different data sources and publish magazines, specialist publications, newspapers, sales documents, as well as staff and customer magazines in apps and online. With our adapter, you can convert your content into the formats you want on a largely automated basis. Media-neutral data generated in this way can be changed and enriched in the CMS. You can publish finished versions and feeds in apps or on your website with WebReader. Publish on other platforms and channels with automated content syndication. We have adapted our standard system over many years of partnership with small and large publishing houses, as well as corporate publishers, to accommodate specific customer demands. Based on an affordable and fair SaaS pricing model, we work closely with staff in the digital department and support publishing houses with customer service. We’ll be happy to advise you on our solutions. A personal point of contact is on hand to provide support when it comes to analysing your needs, developing a concrete concept for implementation, and releasing the system components adapted for you. Please get in touch for a live demonstration and individual quote!